As in my last post, you all know that Nan was suffering from pneumonia. She's no longer suffering as she passed away on Friday night. It is hitting me really hard as I grew really close to her the minute I met her. She gripped my heart instantly and never let go. I loved everything about her. I loved coming over to help her and watch after her. 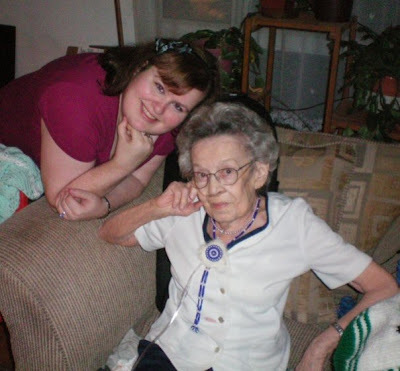 I loved listening to her stories that she would tell even when she had already told me the same story five times before. I loved talking to her about our common interests. I loved our inside jokes. I LOVE HER. - Nan on her 91st birthday last November! She was so funny especially when she would pose for the camera! I suppose I can't really say that at 91 years old that she was exactly taken too soon. She lived a long life! Not many people even reach that age. It just feels that way to me, because I only came to know this fantastic woman in 2004 when I moved here to be with my husband. I'm completely selfish in saying that I wish it had been a longer time frame. I enjoyed every single second. Her visitation is Wednesday and her funeral is Thursday. With that said, I feel that I must take this week off from blogging. I just do not feel in the mood to be posting at this time when my heart, emotions, and thoughts are elsewhere. I will be back next week with my reviews, swatches, etc. etc. Hoping you all understand! I'd also like to thank all of you that offered prayers, wishes, and positive thoughts for Nan (and for me and my family, as well). They do not go unappreciated. It means a great deal! Love to you all. I'm so sorry, its always really hard to let your loved ones go. She is not in pain anymore, and will always live on in your heart. Hey hun....I'm so sorry to hear about Nan. I'm glad to hear she's no longer in pain, but I know how horrendous it is to lose a loved one. I'm sending lots of love and prayers your way...and please pass my love on to Larry as well.